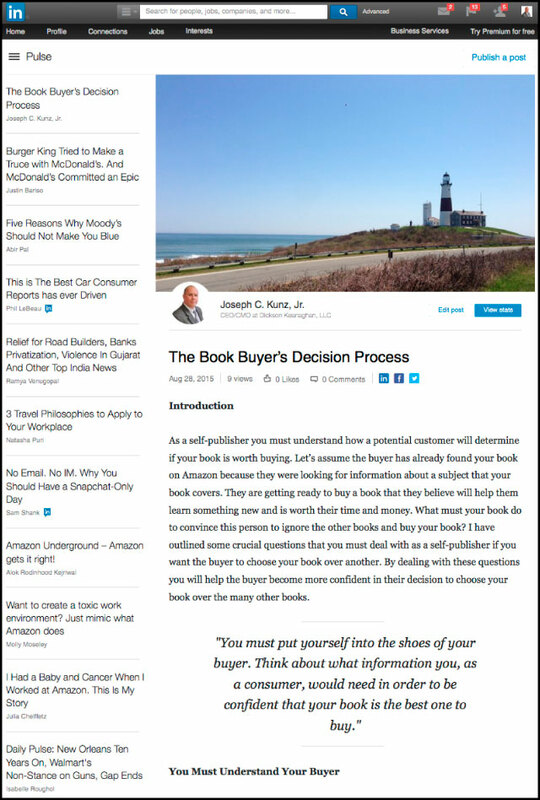 Posted on June 2, 2016 by Joseph C. Kunz, Jr.
What must your book do to convince your audience to ignore the other books and buy your book? I have outlined some crucial questions that you must deal with as a self-publisher if you want the buyer to choose your book over another. By dealing with these questions you will help the buyer become more confident in their decision to choose your book over the many other books. 1. You will learn about the thinking process that your buyers are going through. 2. You will learn what things you must understand about your buyers in order to convince them to buy your book. 3. You will learn what questions you must ask yourself in order to put yourself into the shoes of your buyers. 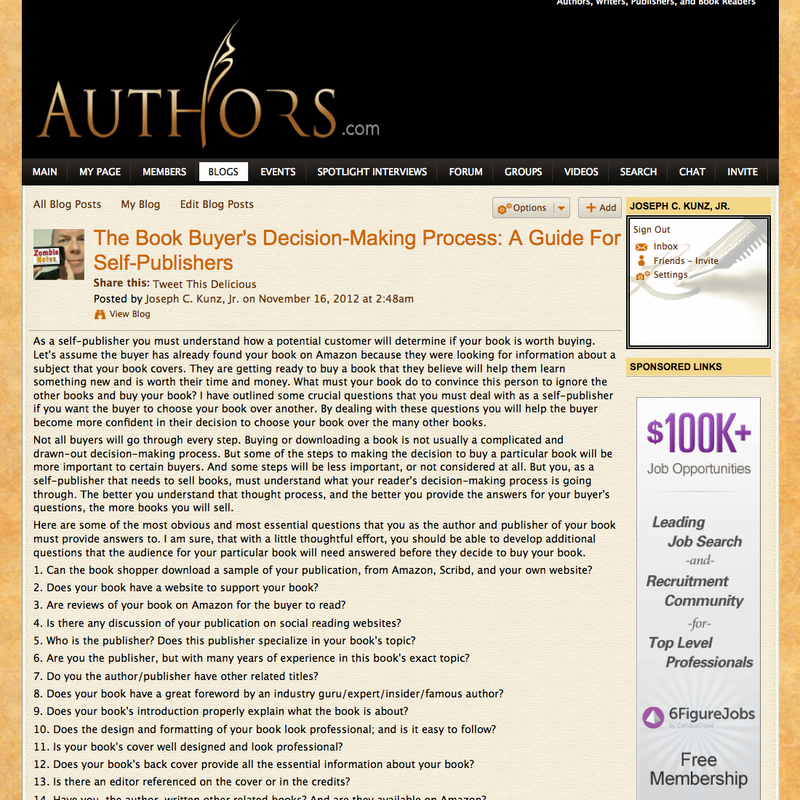 As a self-publisher, you must understand how a potential customer will determine if your book is worth buying or not. Let’s assume the buyer has already found your book on Amazon because they were looking for information about a subject that your book covers. They are hoping to find a book that they believe will help them solve a problem, learn something new, and is worth their time and money. What must your book do to convince this person to ignore the other books and buy your book? I have outlined some crucial questions that you must deal with as a self-publisher if you want the buyer to choose your book over another. By dealing with these questions you will help the buyer become more confident in their decision to choose your book over the many other books. Not all buyers will go through every step. Buying or downloading a book is not usually a complicated and drawn-out decision-making process. But some of the steps to making the decision to buy a particular book will be more important to certain buyers. And some steps will be less important, or not considered at all. But you, as a self-publisher that needs to sell books, must understand what your reader’s decision-making process is going through. The better you understand that thought process, and the better you provide the answers for your buyer’s questions, the more books you will sell. Here are some of the most obvious and most essential questions that you as the author and publisher of your book must provide answers to. I am sure, that with a little thoughtful effort, you should be able to develop additional questions that the audience for your particular book will need answered before they decide to buy your book. Question # 1. Can the book shopper download a sample of your publication, from Amazon, Scribd, and your own website? Question # 2. Does your book have a website to support your book? Question # 3. Are there reviews of your book on Amazon for the buyer to read? Question # 4. Is there any discussion of your publication on social reading websites? Question # 5. Who is the publisher? Does this publisher specialize in your book’s topic? Question # 6. Are you the publisher, but with many years of experience in this book’s exact topic? Question # 7. Do you the author/publisher have other related titles? Question # 8. Does your book have a great foreword by an industry guru, expert, insider, or famous author? Question # 9. Does your book’s introduction properly explain what the book is about? Question # 10. Does the design and formatting of your book look professional; and is it easy to follow? Question # 11. Is your book’s cover well designed and look professional? Question # 12. Does your book’s back cover provide all the essential information about your book? Question # 13. What problems will your book help solve for the reader? Question # 14. Is there an editor referenced on the cover or in the credits? Question # 15. Have you, the author, written other related books? And are they available on Amazon? Question # 16. Besides the ebook edition, is there a print edition? Question # 17. Does your book appear on any best-seller lists, or must-read lists? Question # 18. Does your book’s website answer all of these questions, and many more? As you can see, most of these questions should be answered when you develop and build your marketing plan around your book. Most of the answers to these questions should be easily and quickly available to the buyer. Much of it should be available to the buyer from within your book’s Amazon page. All of it must be available at your book’s own website. Remember, today’s consumer is very sophisticated and very careful with their money. And with amazing companies like Amazon, their choices are almost limitless. Therefore, you must put yourself into the shoes of your buyer. Think about what information you, as a consumer, would need in order to be confident that your book is the best one to buy. This is not a difficult process, but it is an essential one, especially if you have any hope of developing a financially successful book. 1. What are some questions that you believe your readers/audience would be asking first? 2. What things have you already changed in your book or website so that your readers/audience can have more confidence in you and your book? This entry was posted in Amazon, Book Marketing, Design, Foreword, Introduction, Podcast, Websites and tagged Amazon, Book Marketing, Design, Foreword, Introduction, Podcast, Websites. Bookmark the permalink.